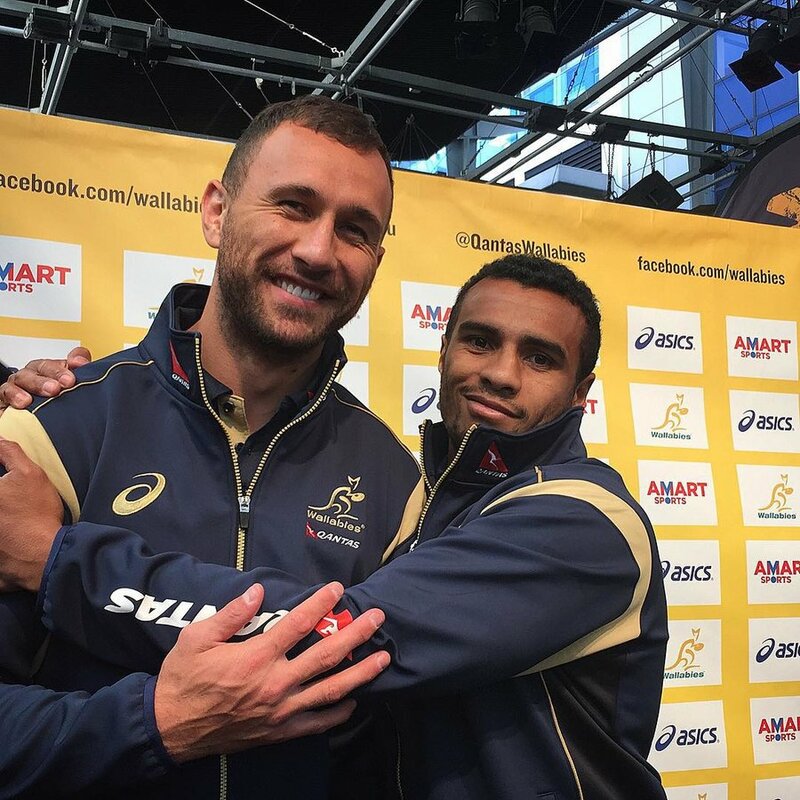 Legendary Wallabies five-eighth Stephen Larkham has defended Quade Cooper and says half-back Will Genia hasn't missed a beat after rejoining the battle for the contentious halves positions. Reds stars Genia and Cooper were Australia's first-choice halves in their big matches at the last Rugby World Cup, but both have both struggled with fitness and form more recently. They are vying with Waratahs duo Nick Phipps and Bernard Foley for the No.9 and No.10 jerseys heading into the World Cup starting next month. The two Queenslanders started in the first Test of the year, but Genia missed the last three following knee surgery and has only rejoined the squad this week. Phipps and Foley started the second and third Tests of the campaign, with Cooper and Nic White filling the run on spots in the last match. Cooper came in for criticism after Australia conceded 21 points after his tackle on the All Blacks' Aaron Smith led to him being sin-binned. Larkham, a World Cup winner in 1999 and now the Wallabies' attack coach, said he was very happy with Cooper's overall effort in the heavy loss in Auckland. "He really only made two mistakes in that game, he threw one pass around the back and he made that head high tackle and that was quite significant in the wash-up of the game," Larkham said. "Including that try (New Zealand scored) 21 points in that ten minutes when he was off the ground, so playing with 14 men against the best team in the world it's going to be difficult and we certainly hadn't planned for that. But apart from that - and we've specifically spoken about the first 25 minutes as being very dominant from our perspective - we were very happy with the way he played." He wasn't overly concerned about Genia not having played for over a month. "He's a bit like (former captain and half-back) George Gregan, he gets himself right," Larkham said. "He knows what his body is doing and he knows what he has to do to get back on the paddock. We've seen it this week. He's come back in from the rehab program now and hasn't missed a beat." Larkham said the Wallabies coaches had a fair idea about their starting halves for the opening World Cup match against Fiji, but would continue looking at different combinations in the lead-up, with Matt Giteau and Matt Toomua other options for the five-eighth spot. "We'll make a decision on our selection based on whether we think combination is going to be important or whether we think the guys can handle a change week to week," Larkham said. He said some players who had participated in every Super Rugby round and Test were likely to be rested for the warm-up match against the United States early next month. "We're being very careful with our preparation going into the World Cup, making sure the guys are fresh when they get there," Larkham said.